Young Sociologist Competition 2013: The Annual Young Sociologist Competition has been organised by the Department of Sociology to identify the potential of the budding sociologists at the undergraduate level. It is a paper presentation competition on a given theme and is open for the undergraduate students in the country having Sociology as one of their subjects. The theme was for the current academic year was ‘Social Institutions in India- Transformation and Consequences.’ Out of the total papers received, ten finalists were selected to present their papers. The final presentation was on Wednesday, December 11, 2013. 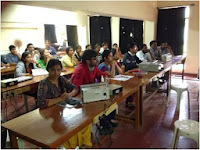 It was held at C105, Central Block, Christ University. The inaugural ceremony was at 9.30 am. The event started with a minute of silence on the demise of the Maharaja followed by invocation song. In his inaugural address, Prof. John Joseph Kennedy, Dean Humanities and Social Sciences spoke about the importance of social institutions in the changing world. 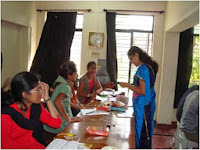 The participants had given clear instruction regarding the format of presentations. The ten finalists presented their papers on various social institutions like religion, education, health and family. It turned out to be a healthy academic exercise where participants fielded questions on methodology and findings asked by both judges and audience. The presentations were judged by two eminent academicians. Prof. B.K Anitha was from National Institute of Advanced Studies (NIAS), Bangalore with her specialisation in gender studies and education. Professor B.K. Anita was identified as being a gender expert in NIAS. Prof. Sobin George from Institute of Social and Economic Change (ISEC), Bangalore is an expert in Urban Sphere and Changing Relations. 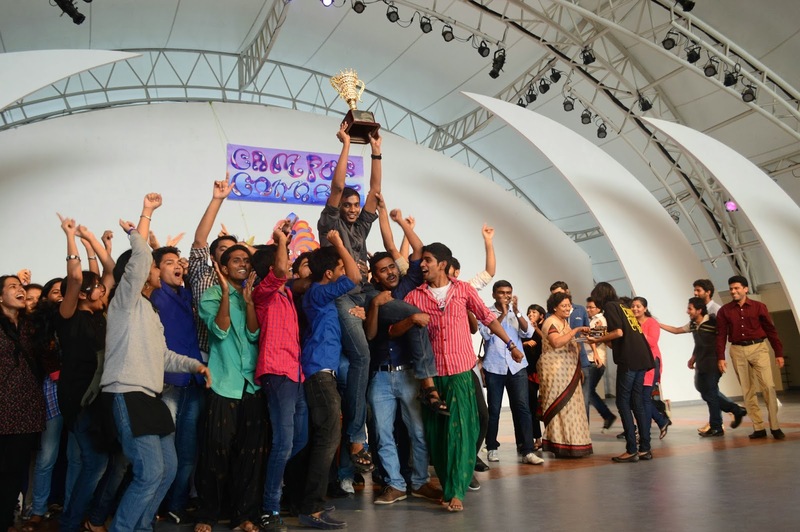 The prize money for the competition was Rupees ten thousand. 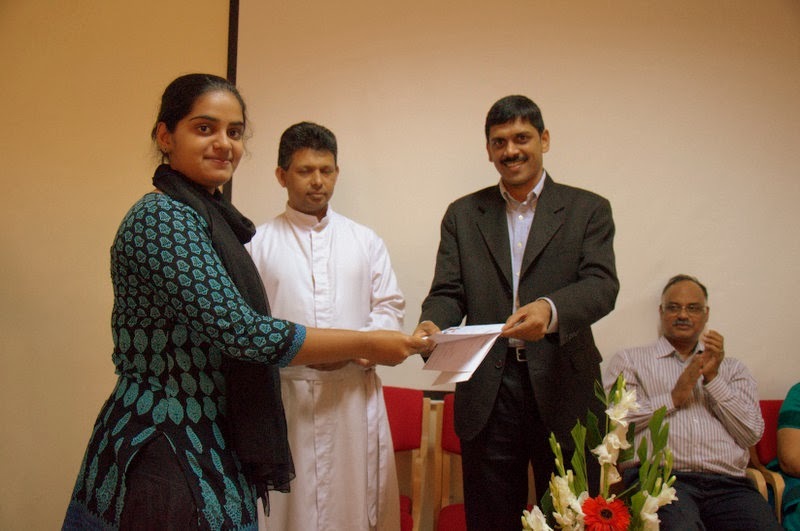 The prizes were given away by Dr. Anil Pinto, Registrar, Christ University. Mr. Mubashir Hameed bagged the first prize for his paper titled ‘Creating Multiple Ties: 'Panapayattu' as Social Agency’. The young Sociologist competition provided a platform for the young students to share their thoughts on pertinent social issues and the suggestions from the judges would help them to sharpen their research and academic skills. 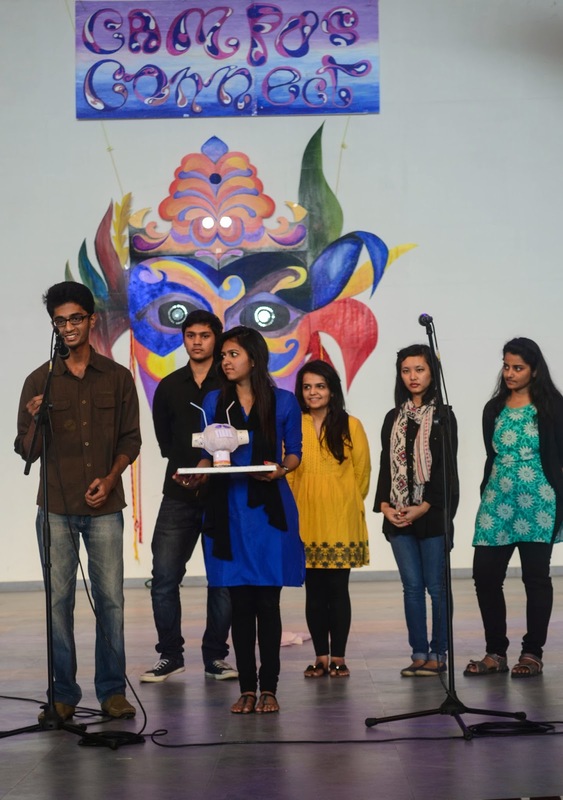 It was an academic exercise to boost the interest of students towards linking their subject with contemporary realities. The Department of Electronics initiated another unique programme, “Tool Learning Workshop” in this academic year, for the benefit of the students. 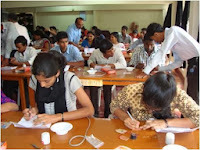 This programme is aiming at providing the necessary practical skills to the students in handling the latest Electronic Equipments in the laboratory. The Electronics Laboratory is recently upgraded with the Digital Storage Oscilloscopes. 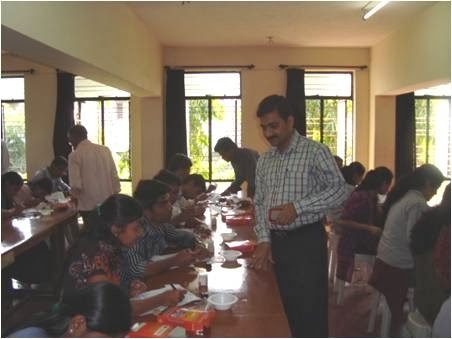 So, this workshop was organized on 5 December 2013 in association with Integrated Services and Consultancy (ISC), Bangalore. 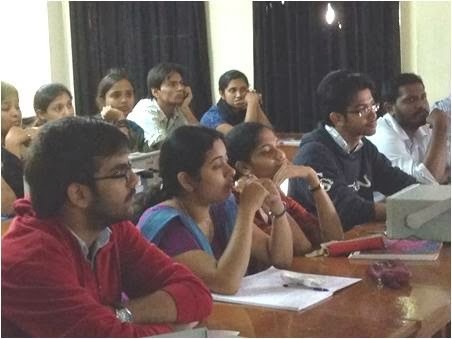 The final year students participated in the Tool Learning Workshop on “Digital Storage Oscilloscope (DSO)”. Mr. Mukund N N introduced the trainers to the students and also briefed about the objectives of the Tool Learning workshop. 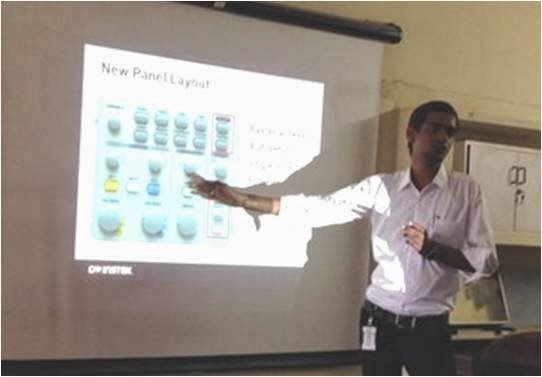 The technical Trainers Mr. Sridhar and Mr. Gururaj from ISC, explained various technical aspects and applications of the DSO in the field of electronic measurements with a power point presentation, followed by a demonstration on how to use the DSO, to the students. After the demo the students were allowed to use the DSOs in the lab and practice various settings on the control panel of the DSO. The students interacted with the trainers with lot of enthusiasm as it was a first time experience for them handling sophisticated equipment like DSO in the lab. 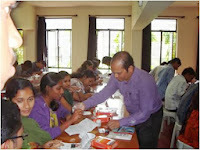 All the students were happy being part of this new initiative from the Department of Electronics. The faculty members from the department were also present during the workshop. Electronics Club had organized a Workshop on PCB Design and Fabrication for Second Year students (PME and CME) on 6th December in association with SP laboratory, Bangalore in Electronics lab, Block I, Christ University. Mr. Johnson.OV, faculty in charge introduced the team members of SP Laboratory to students and briefed about the workshop. Mr. Sukant Kumar Behera, Director, S.P Lab and his team members practically demonstrated various steps involved in PCB etching technology. 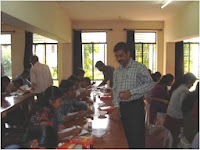 They distributed all the necessary materials, chemicals and electronic components to the students required to design a PCB and to complete a basic Hobby Project. There were fifteen students from IV semester CME class and twenty five students from IV semester PME class participating in the workshop and they all designed and constructed a Light Detector Circuit on PCB. Students enjoyed and appreciated the programme. All the faculty members from the department were also present during the workshop. Course Coordinator distributed certificates to all the participants. ‘OTHELLO’ – The Moor of Venice. In the enviable tradition of presenting a Shakespearean drama – unabridged – every year, the School of Law, Christ University presents Shakespeare’s immortal classic ‘Othello’ this year. On November 30 and December 1 in the Christ University main auditorium (also one of the finest in Bangalore) and on December 3 in Kengeri campus. Handpicked from a clutch of premium actors, the key roles of OTHELLO are played by mature actors who show remarkable prescience and understanding of the vagaries of the human psyche coupled with the tragedy of ambition. 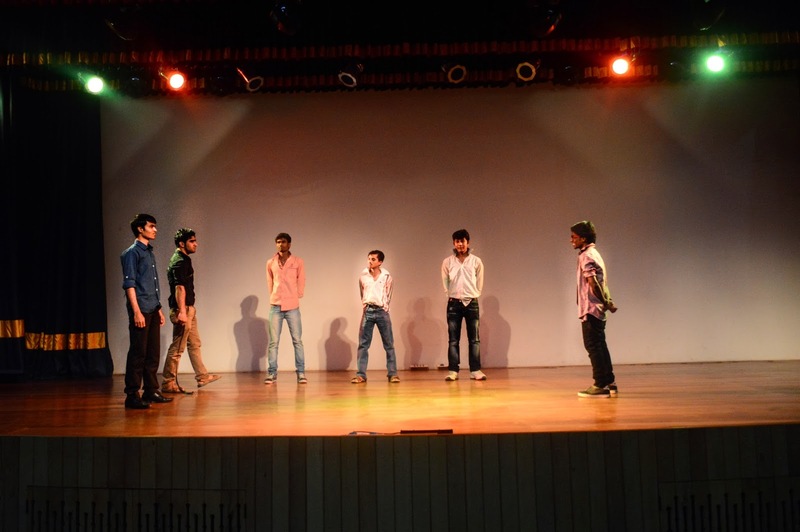 Christ University’s venture into mega productions began in 2012. With script,music and dance entirely written, composed and created by students across the disciplines of the University, ‘Of Power and Passion’ was produced in 2012 and ‘Francesco’ was presented in 2013. ‘David- The Warrior, The King, The Man’ will be staged in March 2014. 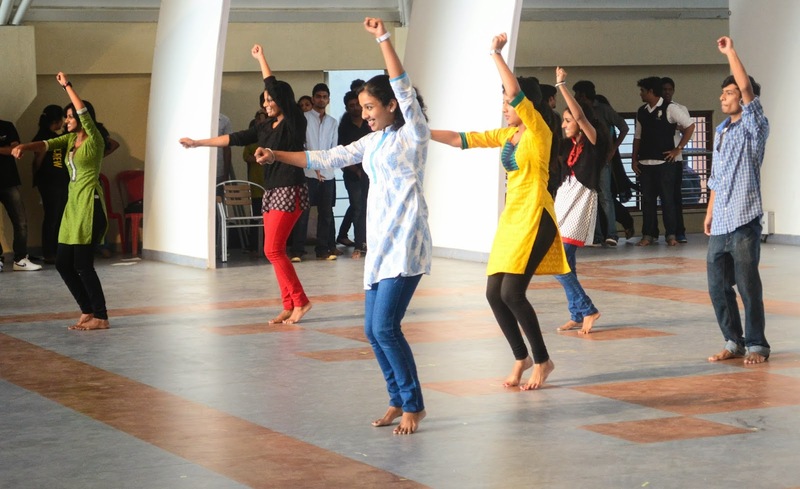 It is the first University n the country to have pioneered a degree programme in Theatre Studies – the first performance by the Theatre Studies Students was ‘ Savre’ a revue of excerpts from musical theatre of the 20th century. Likewise, the School of Law performed Shakespeare’s‘The Merchant Of Venice’in 2012 and will now present ‘Othello’ in November, this year. The play is directed by theatre professional Esther Yates,who trainedin the Calcutta Light Opera Group and Society and with Pearl and Alyque Padamsee later. ‘Othello’ by the School of Law promises to deliver powerful, poignant and piquant performances and theatrical genius rarely seen at university levels. Campus Connect 2013-14 was held on 4 Dec 2013 in CUFE Campus, Kengeri. Participating departments for this event were Christ University Faculty of Engineering and Department of Commerce, Christ University. The event was attended by about 1400 students from the Commerce Department, and 1100 students from CUFE. The daylong event consisted of various competitions in the Sports, Art, Cultural and Literary fields. The event was well attended and saw some excellent performances from students from both the departments. Mr. Abhishek began the workshop began with a quick quiz based on current affairs, environmental issues and general facts which aroused the interest of all the students. He then ventured into his lecture, orienting the students towards the key issue in question - environmentalism. By defining Environmentalism as a perspective which deifies nature and at the same time is protected for survival and preservation of the species, he questioned the gap between the “environment” and “human beings”. Should this gap be? If it already is, is this a binary? Through motivated interaction with the students, Abhishek came up with reasons for this ‘othering’, the difference between the “natural” and the “human” such as - scientific ways of dealing with issues, socialization, illusion of control, human tendency towards self-preservation and looking at nature as a value-added product. In the course of the lecture, he also addressed important issues and questions in the realm of Philosophy such as whether Environmentalism is an ideology, a kind of an orientation which shapes a particular kind of thought pattern in a group or a consciousness, and an alert reaction arising out of certain awareness. He also spoke about ownership/illusion of ownership and what defines it. Boundaries define ownership and the more we enter into the realm of language we move further away from nature. Human beings have a special ability - they can spatially manipulate, which differentiates them from animals and other species. This tendency to manipulate, predict, and anticipate (which emerges from thought) produces a sense of duty or guilt which again gives rise to an environmental consciousness. Even narratives of nature stem from perspectives - romantic, aesthetic, scientific, industrious and/or pragmatic. He showed the students a documentary film on snakes and human encounters with them. Snakes are found in most places of remote human interaction. The illusion of spatial manipulation makes human beings feel as though what they do in human spaces does not affect the others but the human-nature connection is strengthened and enabled when the human is in a limited space. The documentary film showed the students how snakes shy away from humans and attack only as a last resort. Government guidelines and general information about snakes posits only venomous ones as those that they need to know about, where as information about non-venomous snakes is just as important for safety, identification and preservation. Even the given information is not adequate. The post lunch session comprised an understanding of landscapes and “development” through reading maps. The questions he speculated here were: At what cost do we develop? Does development take landscape into account?, etc. The map exercise was to help the students understand how development, through analysis of a particular landmark in an area affects and changes the landscape and the ecology of the space. It was to enable an imagination of the space beyond the two dimensions of the map. The land use patterns (what it was used for and how it is being used) and implicit consumption patterns (kinds of waste and water consumption) often suggested the kind of development and shift in landscape. The second day consisted of sessions on Aesthetics of Nature and developing eco-consciousness and group activities based on the lectures and concepts in the workshop. The discourse addressed notions of environmental consciousness which comes through experience with nature. Nature is often associated with a static temporality- not capable of change. Human vs. Non-Human is often synonymously associated with the Urban vs. Rural vs. Nature category. Does manipulation, consumption, adaptation and artifice what define a human space? If so, can we restore the balance that we cause with our lifestyles and habitat consumption? Do animals not have this sense of environmental consciousness that we often take for granted? The session ended with each of the groups presenting on their respective topics which related problems of urban settlements to environmentalism. Each of the groups made an audio-visual presentation, which was followed by feedback and questions. The workshop ended with a vote of thanks and it gave us an opportunity to interact with an expert on the field and at the same time get newer insights and philosophies on ecological discourses. The sessions did not resolve or give definitive answers to the problems addressed but stimulated us to think on those lines and problematize simplified notions of activism, environmentalism and consciousness that are often given and subscribed to by us. Department of History, Christ University in collaboration with Archaeological Survey Of India, Bengaluru Circle organised a two day National Seminar on South Indian Archaeology on 25-26 November, 2013 with the main aim of enhancing perceptions about History, Archaeology, Architecture and Heritage as it coincided with World Heritage Week that was celebrated in India from 19-25 November, 2013. The seminar was broadly divided into Pre-History, Mesolithic, Neolithic, Chalcolithic, Megalithic, Architecture of South India, Archaeological excavations of Karnataka, Andhra Pradesh , Tamil Nadu, Kerala, Marine Archaeology, Archaeological excavations and Roman trade with India. This two day National Seminar was segregated into 6 slots exclusive of the inauguration and valedictory. The seminar was inaugurated with an address by Dr. Anil J. Pinto, Registrar, Christ University, key note address by Dr. Prof. K. S. Mathew, Director, Institute for Research in Social Sciences and Humanities, concept note by Dr. S. P. Vagishwari, HOD History, Christ University. With the Presidential remarks by Dr. John Joseph Kennedy, Dean, Humanities and Social Sciences, Christ University. This formal session concluded with Dr.Fr. Jose C.C., Associate Professor, Department of History, Christ University thanking the gathering. Session 1 of the seminar began at 11.00am to 12.15 pm during which Prof. A. Sundara ,Rtd. Professor, Karnataka University, Dharwad presented his paper on South Indian Megalithic Culture with reference to Bengaluru:Some highlights, in which he focussed on 90+ megalithic sites in Bengaluru. The next paper was by was Dr. Jenee Peter, Assistant Professor, Union Christian College, Aluva on ‘From Megalithic to Early Historic:The changing notions of space and time in South India’ which discussed the on issue of empirical evidence from the archaeological sites of Kerala. The session on Maritime Archaeology and Roman Trade saw two research papers. The first one by by Dr. Sila Tripathi, Marine Archaeological Centre, National Institute of Oceanography, Goa was on ‘Maritime Archaeology of South India : Prospects for Maritime Archaeological Researches along the South Indian Coast’. The paper examined various maritime activities and underwater explorations at Poompuhar, Tranquebar, Pondicherry, Mahabalipuram and Manapad waters. Another paper of the session was presented by Dr. Fr. Jose C.C., Associate Professor, Department of History, Christ University entitled ‘Indo-Roman links :Evidences from Archaeological Findings’. His paper focussed on literary references that are extensively available to understand the pattern of trade between India and Rome. Session 3 titled as Art and Architecture had Mr. T.M. Keshava, Dy. Superintending Archaeologist, ASI, Bengaluru presenting his paper on Glimpses of Karnataka Architecture which brought to the forefront religious architecture of the state from 2nd century BC to 16th century highlighting the participation of major dynasties and changes they brought into the varied style of architecture. The second paper was ‘ Deconstructing the Perceived Truths’ by Dr. S. P. Vagishwari, Associate Professor and HOD ,Department of History, Christ University. Through her paper, she challenged the western notions of stagnation ,decadence and tasteless in relation to classical Indian sculpture and architecture by arguing as to how perceptions of change ,progress and aesthetics are relative. Day two on 26 – 11 – 2013 started with the 4th session titled as Pre History and Excavations in India during which 4 papers were presented. First by Prof. Ravi Korisettar , Rtd Prof. Ancient Indian History and Epigraphy, Karnataka University , Dharwad titled as ‘Prehistory of South India :A tribute to Robert Bruce Foote’ which summarised current knowledge of stone cultures in southern India. Second paper was by Dr. V.N. Prabhakar, Superintending Archaeologist ASI, Excavation Branch, Purana Quila, New Delhi on Recent Excavations at a Harappan settlement in Karanpura, District Hanumangarh, Rajasthan. Next paper of the session was by Prof. Sharada Srinivasan NIAS, Bengaluru on Metallurgy in Archaeology where she mapped out the metallurgical knowledge of Ancient India. Mr. C.B. Patil, Dy. Superintending Archaeologist, ASI, Bengaluru, spoke on Archaeological explorations and excavations - Principles and Methods. The final session titled as Archaeology: Theory and Practice saw three papers. Dr. Nambirajan, Superintending Archaeologist, ASI,Bengaluru focussed on Major Archaeological Excavations in India whereas Mr. N. Nikhil Das, Assistant Archaeologist ASI, Bengaluru drew possible connection between the rock art and Megaliths in South India, an appraisal on Kerala Rock Art. The last paper of the national seminar was by Ms. Sujana Stephen, Assistnat Archaeologist, ASI, Bengaluru on Major approaches in Archaeological Research with special reference to Landscape archaeology.